Otwórz sklep Mac App Store, aby kupić i pobrać aplikacje. 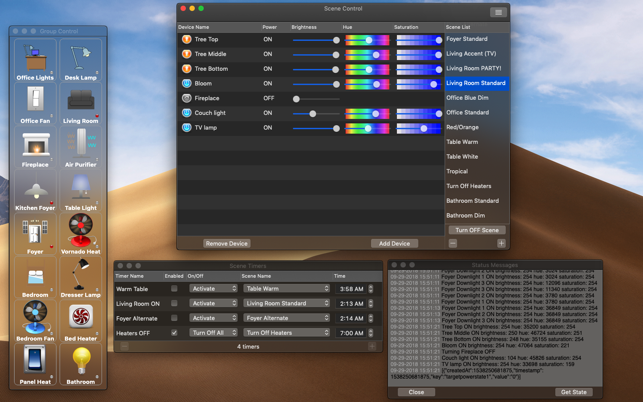 HomeControl is a HomeKit alternative for MacOS. It controls Philips Hue lights, TP-Link Smart Bulbs, TP-Link wall switches/dimmers, Belkin Wemo switches, iHome SmartPlugs, and TP-Link SmartPlugs. It offers great functionality for power users. Control many devices/groups/scenes quickly from your computer. A lot of work has gone into this app. All of the devices listed below have been fully tested, and work well. ● Multiple Hue Bridges can be used simultaneously. ● All devices can be controlled individually or in groups. ● Device Groups can be set to also control subgroups, ie: an "Office Lights" group can also control a "Desk Lamps" subgroup. 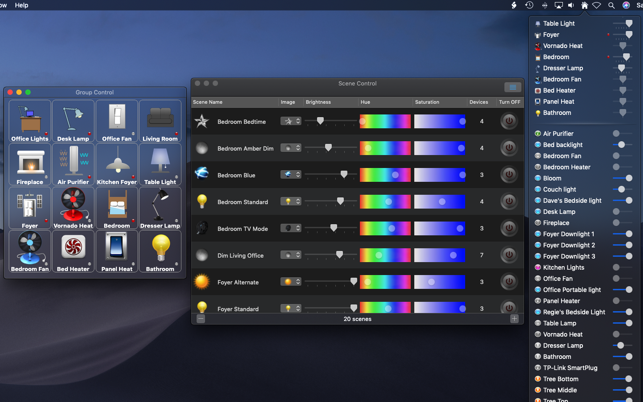 ● Menu-bar control allows quick access to all groups and devices. ● Full configuration can be saved to disk. This allows easy configuration of multiple networked MacOS computers. ● Added checks to prevent user-errors when adding iHome devices. 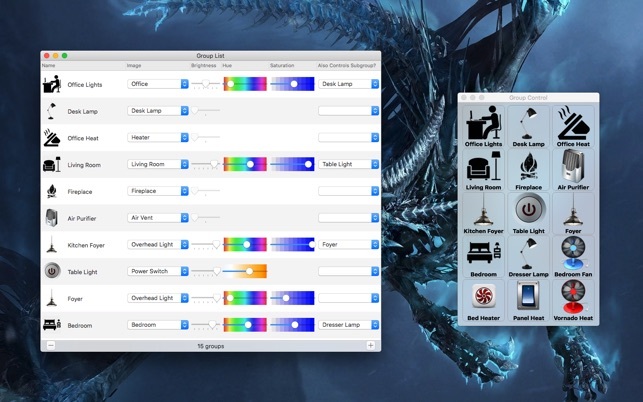 ● Hue White Ambiance Lights now fully supported. ● Automatic Device Discovery for Wemo switches, with device names! ● Simple iHome setup added! Auto Discovery for iHome SmartPlugs! ● Multiple Hue Bridges are now supported! ● Faster device state updates for huge amounts of devices! ● TP-Link Smart Plugs are now supported! ● TP-Link Smart Bulbs are now supported! ● TP-Link Smart Switches are now supported! There are Lifx bulbs and iHome smart plugs in my office, controlled using a combination of Siri/HomeKit, Google Home Mini, and a mix of Mac and iOS apps. While the iHome smart plugs haven't been particularly dependable, HomeControl has been the most reliable system for controlling them, potentially better than the official iHome app itself (which always shows at least one plug as offline every time I open it). The plugs respond more quickly and more consistently to HomeControl than with any other app, and certainly better than any cloud service like Google Home. Well done! Local control (not a remote service link) makes all the difference. 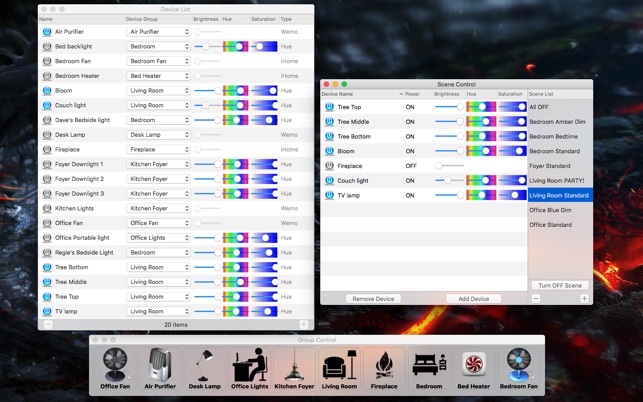 With that said, I haven't used any of the scenes or other features of HomeControl, since it doesn't support the dimmable/RGB bulbs I have installed at the office. 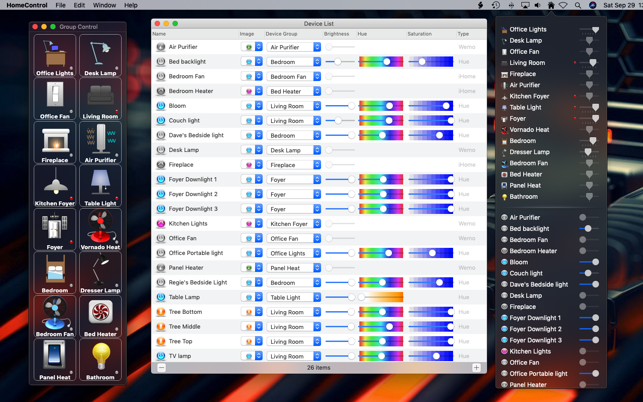 Two features I hope can be implemented in the future: Lifx bulb support (I know the local control isn't enjoyable to program for, but it's worth it) and a menubar-exclusive setting (so I don't need to keep the app running in my dock all the time). 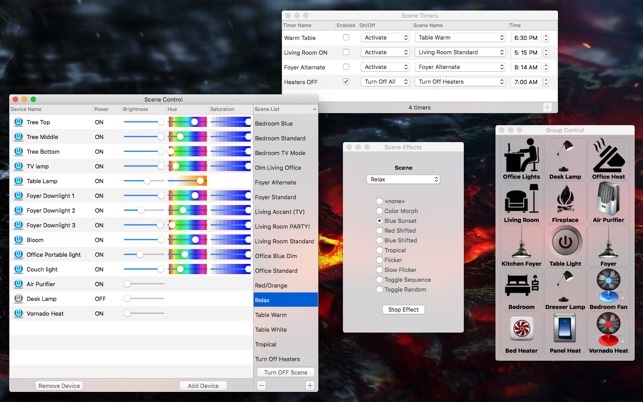 Originally purchased the app to control 1 Hue bridge persistently (not having to re-logon everytime I started the computer), which it did great! Contacted the developer to see if multiple bridges could be done (I have some unique needs), he was super helpful and went well out of his way to solve my problems. Would highly recommend this app to anyone that’s putting together a smart home. There are always new updates rolling out, so new features are always being added. This is one of the few Smart Home apps that is actively being worked on and not abandoned by their developer(s). Well worth the money. I have a Hue setup with mostly Hue lightbulbs, but also have 2 Wemos. This app is exactly what I was looking for. 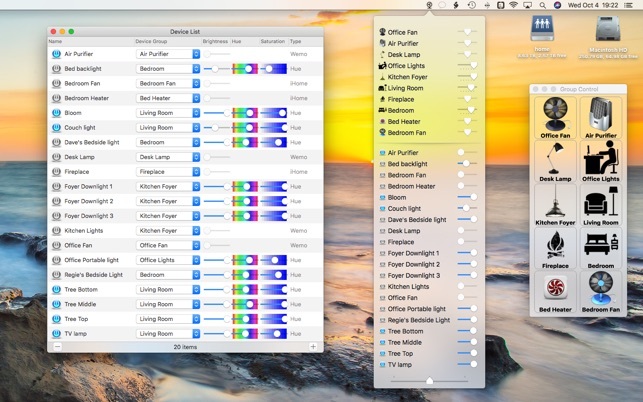 It controls all of my Hue bulbs and Wemos with simple menus. 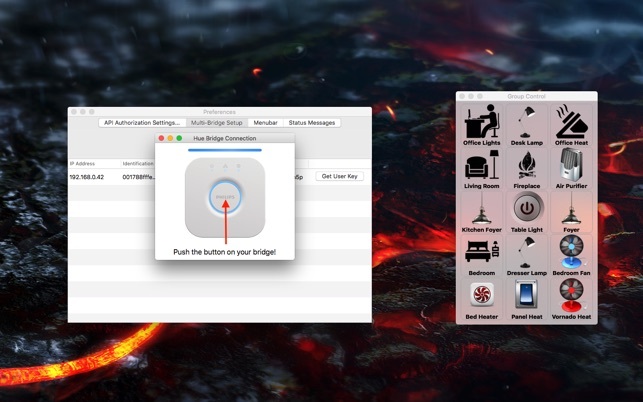 It is much more than just a menubar toggle (although it does that too!). I love that I can setup my scenes and control everything on my iMac. It is a perfect control station. Just for fun, I actually also installed this app on an old 2010 Mabook Pro, not really expecting anything. I was deligted to see that it works perfectly on my old computer too! Awesome.